You want to do everything it takes to keep Scammerlocker Ransomware away. If you are unable to do that, this infection can corrupt many of your personal files. Although this threat is a real file-encryptor, and decrypting the files it corrupts is unlikely to be possible, in comparison to other similar threats, it is not the worst one. That is because this infection is set to corrupt files only in %USERPROFILE%\Desktop, %USERPROFILE%\Documents, %USERPROFILE%\Videos, and %USERPROFILE%\Pictures directories. If you do not keep your personal files in these directories, you might be unharmed even if this malicious threat slithers in. 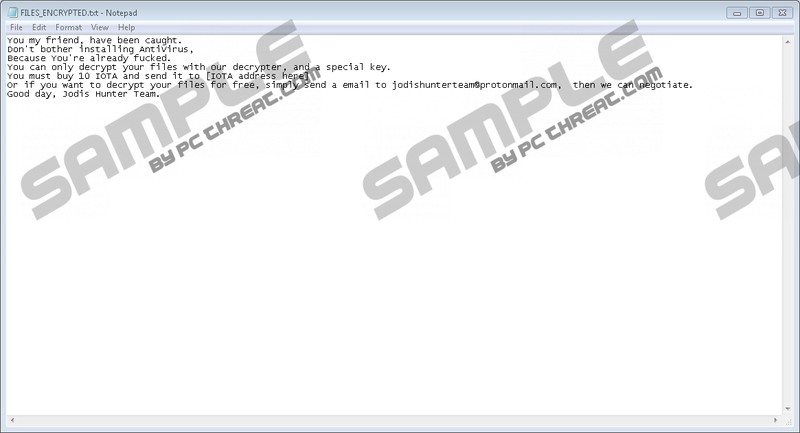 Note that when it encrypts files, it attaches the “.jodis” extension to their names, and so if the gets slithers in, you should check your personal files if they were encrypted, and then you should immediately remove Scammerlocker Ransomware. The bad news is that you will not get your files decrypted if you delete this malicious threat. Nonetheless, that must be done ASAP. Scammerlocker Ransomware is unlikely to have been created by cyber criminals who are responsible for Ultimo Ransomware, Ransomuserlocker Ransomware, Krypton Ransomware, and similar infections, but they all have several things in common. For one, they were created using the same Hidden Tear open source code. Anyone can use it, which is why many of the threats that derive from this family are not always functional. The second thing they all have in common is the goal, which is to make the victim pay a ransom. You might have let in Scammerlocker Ransomware by opening a corrupted spam email attachment or by downloading malicious software, and, as soon as it is in, this infection starts corrupting files in the aforementioned directories. The infection does not corrupt all files that are located in them because it is set to specifically corrupt .txt, .mp3, .html, .php, .doc, .mov, and similar files. Our research team reports that the threat should encrypt at least 32 different types of files. As soon as these files are encrypted, the infection creates a ransom note file named “FILES_ENCRYPTED.txt.” It is safe for you to open this file, but do not forget to delete it when you start the removal of the ransomware. According to the ransom note shown to you by Scammerlocker Ransomware, you need a decryption tool and a key to free the files that are corrupted by the malicious infection. The note offers two solutions. You can either pay a ransom of 10 IOTA (cryptocurrency), which is around 12 USD, or you can email the creator of the threat at jodishunterteam@protonmail.com to “negotiate” a deal. If you go with the first option, you will have to set up a wallet, purchase IOTA, and send it to a special address. If you choose to email cyber criminals, most likely, you will be forced to do the same. The devious cyber criminals – who are introducing themselves as the “Jodis Hunter Team” – cannot be trusted. There are no guarantees that they would provide you with a decryptor regardless of what you do. Our research team has had the “pleasure” of analyzing hundreds of ransomware threats, and one thing that rarely changes is that the victims are always duped. Of course, because the ransom is not huge, some might choose to take the risk, and if you are thinking about doing the same, make sure you think things through. In either case, removing Scammerlocker Ransomware must not be forgotten. Can you delete Scammerlocker Ransomware manually? That all depends on your ability to find and erase the launcher file. Do you know where it is? If you do, go ahead and remove it as soon as possible. After that, erase every single copy of the ransom note file. Finally, install a trusted malware scanner to inspect the operating system. Even if you think your operating system is clean, it is possible that something hidden could still be present, and, needless to say, you want to get rid of it. If you are unable to remove Scammerlocker Ransomware yourself, as well as to keep your system protected against malware, installing anti-malware software is the best decision you can make. Should you have questions about the removal process or the protection of the system, add them to the questions area. Tap Ctrl+Alt+Delete and select Start Task Manager. Click the Processes tab and look for unfamiliar processes. If you discover a malicious one, right-click it and select Open File Location. Select the process and click End Process. Right-click the .exe file and choose Delete. Delete all copies of the ransom note file, FILES_ENCRYPTED.txt. Empty Recycle Bin and immediately perform a full system scan to check for leftovers. Quick & tested solution for Scammerlocker Ransomware removal.